Are you ready for A Wrinkle in Time? I cannot wait. I have a huge thing for time travel and dimensions. I inhale every book I can read on the subject. Though, this one was a bit beyond my brain when I was a kid. I just started reading it again to prepare for the movie, and I just love it. Check out the trailer below! Doesn’t it look so amazing? They are three of my favorite ladies! 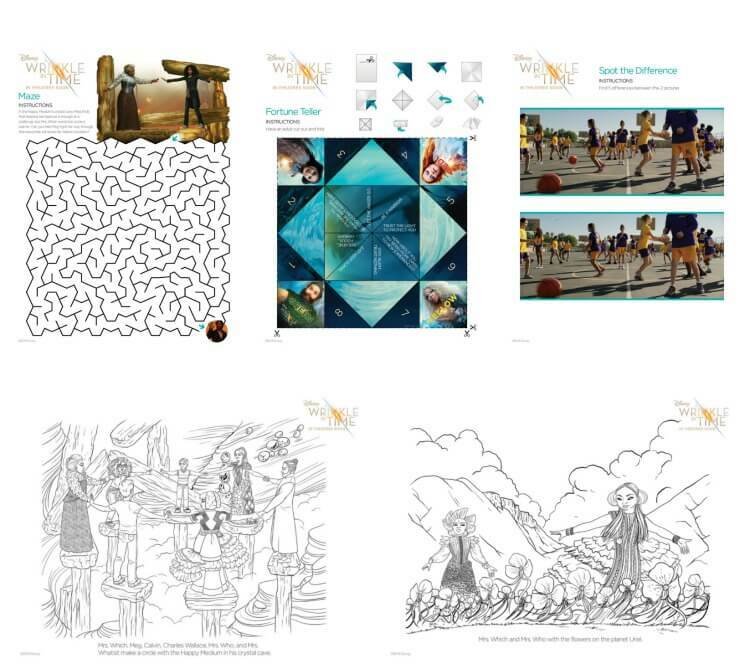 I’ve also got some fun activity sheets! There’ s a fortune teller, spot the difference, coloring pages, and mine and my kids’ favorite – a maze! Click any of the images below to download the whole set! 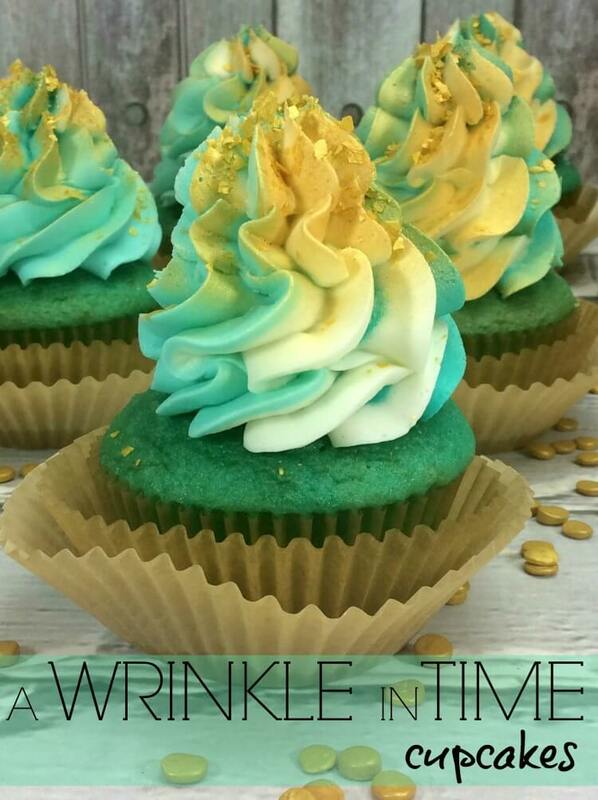 We can’t see a movie without a delicious treat, so here’s A Wrinkle in Time Cupcakes! This will make 18 cupcakes. When the cupcakes have cooled, you will make a swirled frosting. After you’ve made the frosting, split it into three bowls. To create the swirled frosting, place the piping bag into a large cup and fold the sides over the edge of the cup. Take a big spoonful of light teal frosting and spoon it onto one side of the piping bag. 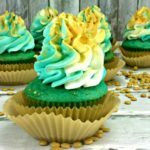 Take a big spoonful of the white frosting and spoon it next to the teal color. Take a big spoonful of the dark teal frosting and spoon it next to the white icing. Now remove the piping bag from the cup and squeeze it together. Frost the top of the cupcake with the frosting. The frosting should come out in a swirl of colors. 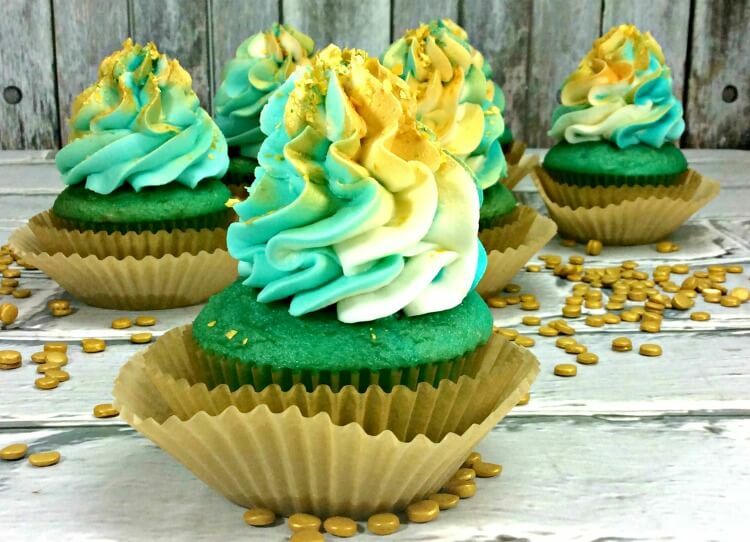 The gold spray can get on the exposed part of the cupcake, so if you want to prevent that, you can shield it with a paper towel or a piece of paper before spraying. Then, lightly spray the white part of the frosting swirl and then also lightly spray the dark teal. Top it off with gold cake sprinkles. Preheat oven to 350 F degrees and place liners in cupcake pan. With an electric mixer beat sugar and butter until creamed. Beat in vanilla extract, salt, baking soda, and baking powder. Combine the heavy cream into the wet mixture. Add in the flour, 1/4 cup at a time. Add the drops of food coloring. Spoon batter into each liner about 1/2 full. Bake in oven for about 20-22 minutes or until the center of the cupcake comes out clean with a toothpick. 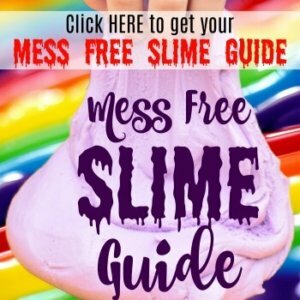 Combine all ingredients in a large bowl, except the food coloring, and mix on low speed with an electric mixer until combined and stiff peaks form. Split the frosting into three bowls. In one bowl add 2 drops of teal food coloring and mix until you have a light teal color. In the second bowl, add 3-5 drops of teal food coloring until you get a dark teal color. Fit a piping bag with a large star tip and place the bag into a large cup and fold the sides over the edge of the cup. Take a big spoonful of the light teal frosting and spoon it onto one side of the piping bag. Take a big spoonful of the white frosting and spoon it next to the teal color. Take a big spoonful of the dark teal frosting and spoon it next to the white icing. Remove the piping bag from the cup and squeeze it together. Using the gold cake spray, lightly spray the white part of the frosting and then spray the dark teal lightly with the spray. You might want to use a paper towel or something to shield the exposed cupcake from being sprayed gold. Lastly, add some of the gold cake sprinkles on top of the cupcake. Well that’s cute! Love the two-toned frosting. I can’t believe Oprah is in this movie. How fun is that! I’ll have to watch it just to see her in it. Those cupcakes look so good! I love the color, and I love the absolute mountain of frosting you put on top. Om nom nom. I love that multi-color frosting. 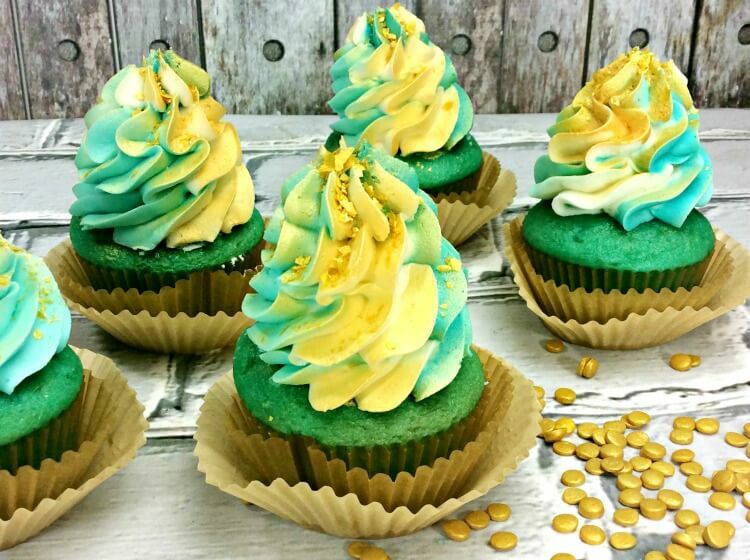 These cupcakes are seriously beautiful. I want to make up a batch of these and stuff my face with them. Those are some adorable cupcakes! They look so fascinating! I like the colors of the frosting, with the sprinkles of gold. I have never read a Wrinkle in time so I have no clue what it is about, but the movie I want to see!! Those cupcakes look stunning!! I love vibrant colour and the gold flecks!! Delicious! These cupcakes are beautiful. They remind me of the cupcakes at Gigi’s Cupcakes shop in Kansas City. They also look like they taste amazing! You definitely did an amazing job with the cupcakes! It’s really beautiful. I’m not sure if I can pull these off but I would love to give it a try. I also love the printables that you shared! I love the swirled frosting. So pretty and I love how you used the colors in the film to match the cupcakes. That buttercream looks amazing. This color scheme is easily one of my favorites. I could eat these everyday based on that alone. These look super tasty and now all I’m craving is cake. Guess I’ll have to make these tomorrow.